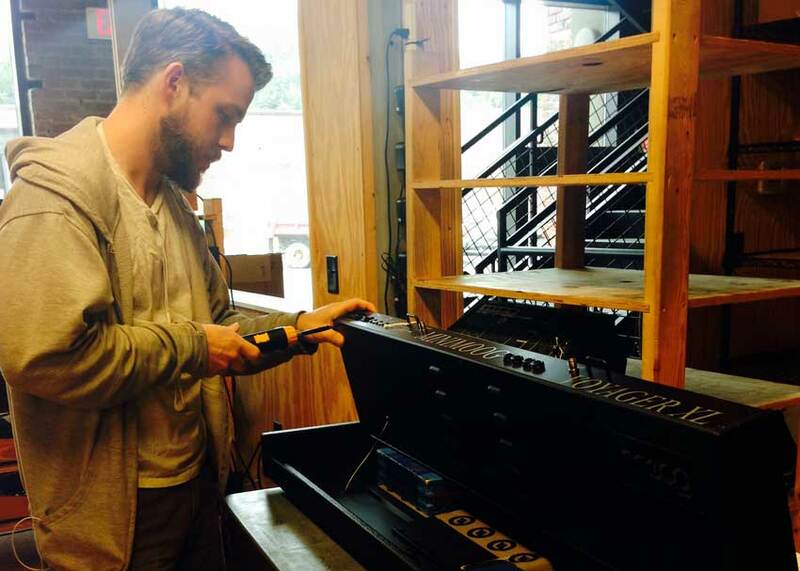 Asheville, North Carolina is a mecca for artists and musicians of all stripes — but it’s especially dear to the hearts of analog synthesizer enthusiasts. 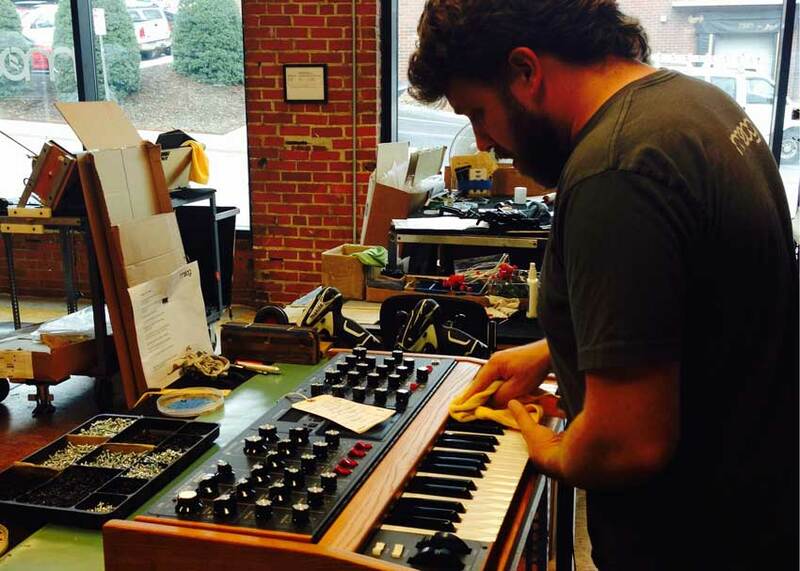 That’s because Asheville is home to the Moog synthesizer factory, where 61 full-time Moog Music employees work to carry on the legacy of the company’s famous founder, Dr. Bob Moog. 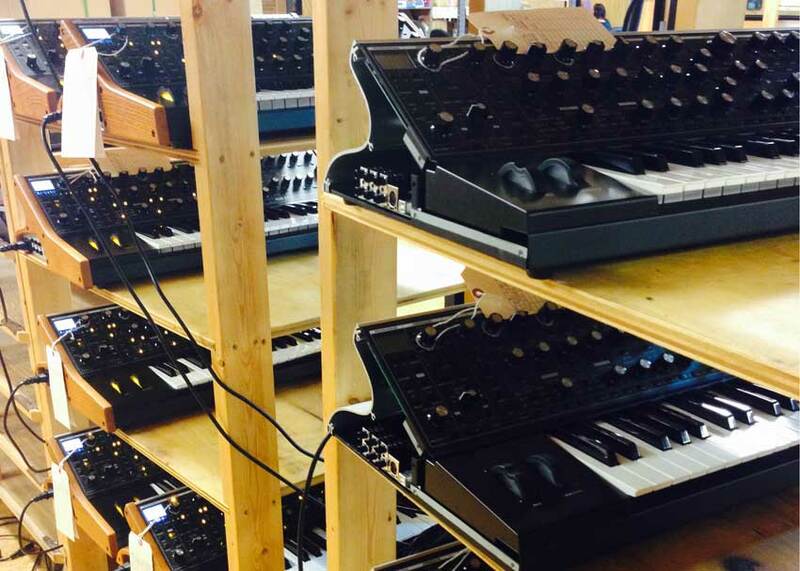 Everything Moog does is under this roof — from hand-building instruments, to design and engineering, to sales and marketing, to shipping, to servicing old synths. 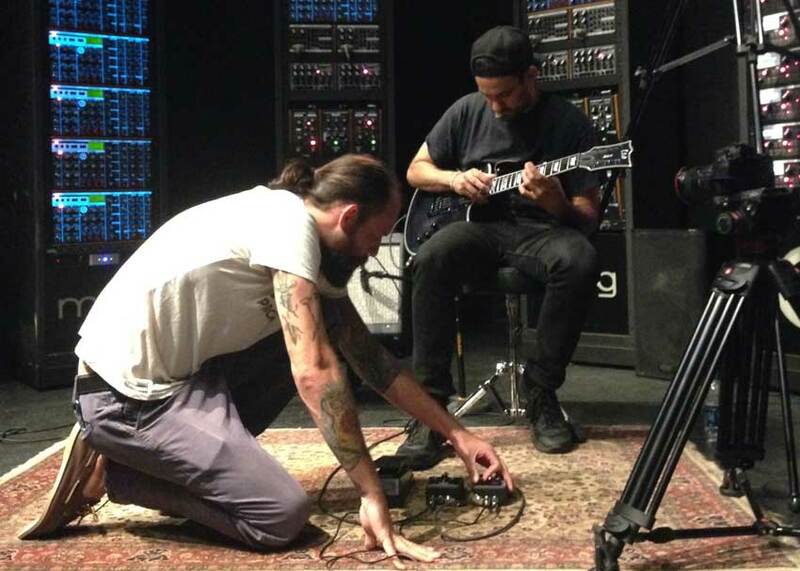 There’s also the Moog Sound Lab, a multimedia recording studio where touring musicians make a point of stopping by to perform with Moog gear. 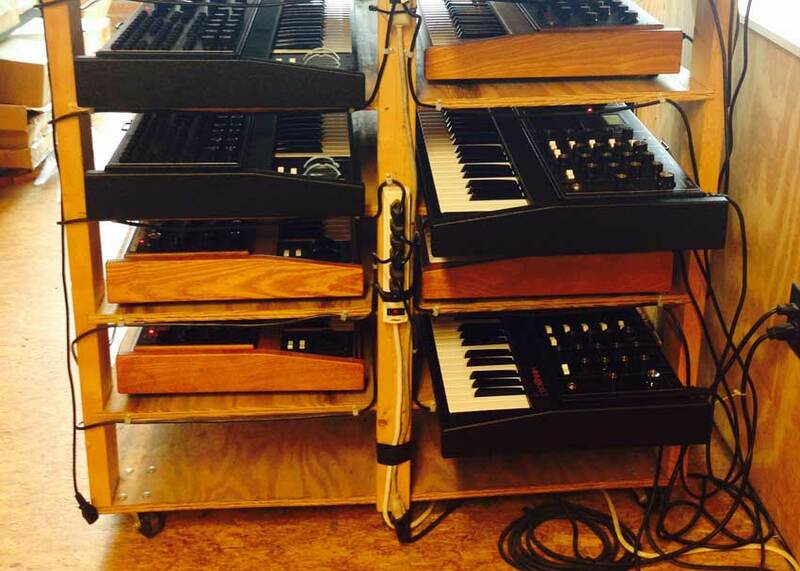 Have you ever seen so many Moog synths in one place? 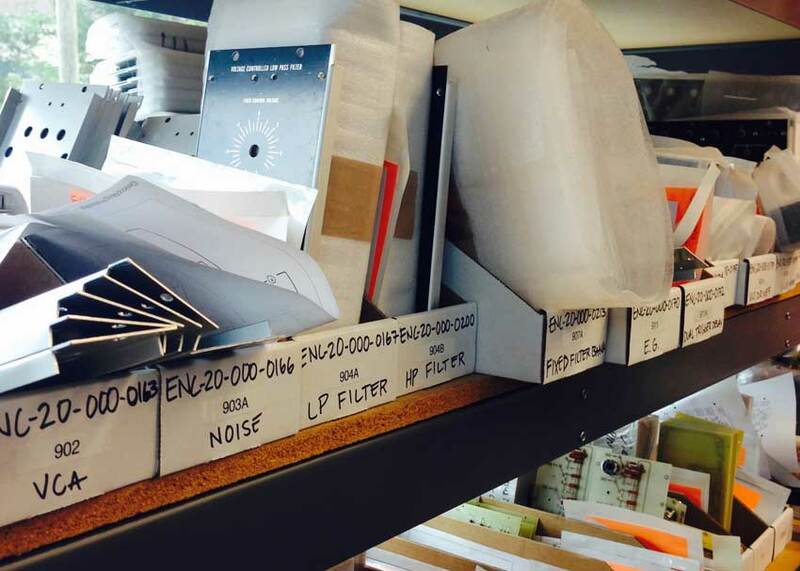 Take a look inside the Moog synthesizer factory in our photo gallery — and be sure to look through our notes below! 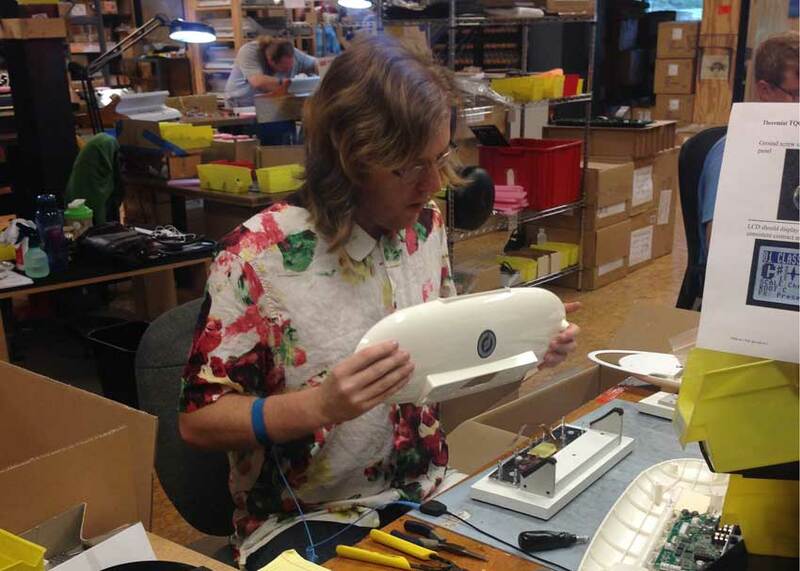 Once each Voyager XL is assembled, a technician opens up the case and sets about 30 different calibration points down to the millivolt. Moog Sub Phatty and Sub 37 synthesizers stand at attention under the American flag. If any analog components in these Moog Sub Phatty synths are going to go bad, it’ll happen during this 48-hour burn-in process. The most Minimoog Voyager XL synthesizers we’ve seen in one place — including both the Tolex edition and wood case models. One of Moog’s newest products, the Theremini pairs a digital sound engine with the analog control of the Theremin antennae. A look at the circuit board inside the Theremini’s case. 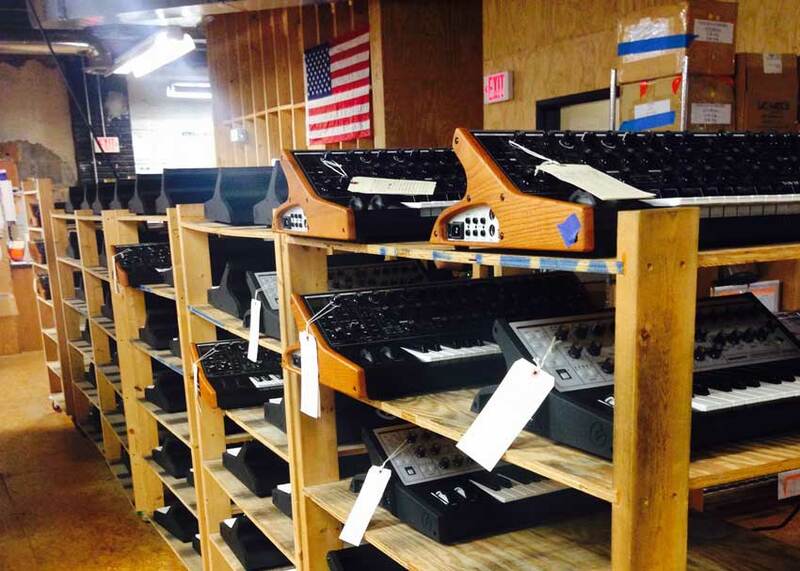 Moog’s warehouse is small — they typically don’t keep inventory on hand. 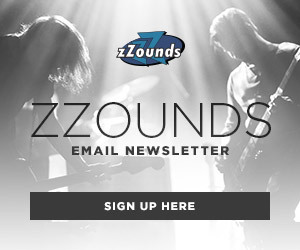 Instead, they build instruments (like these Sub 37s and Sub Phattys) as customers (like zZounds) order them. The aliens have landed. 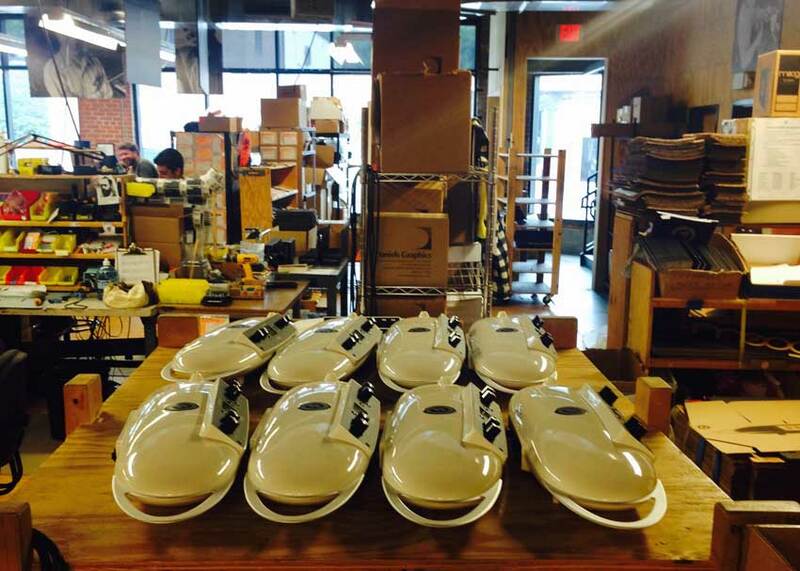 It’s a Moog Theremini invasion! 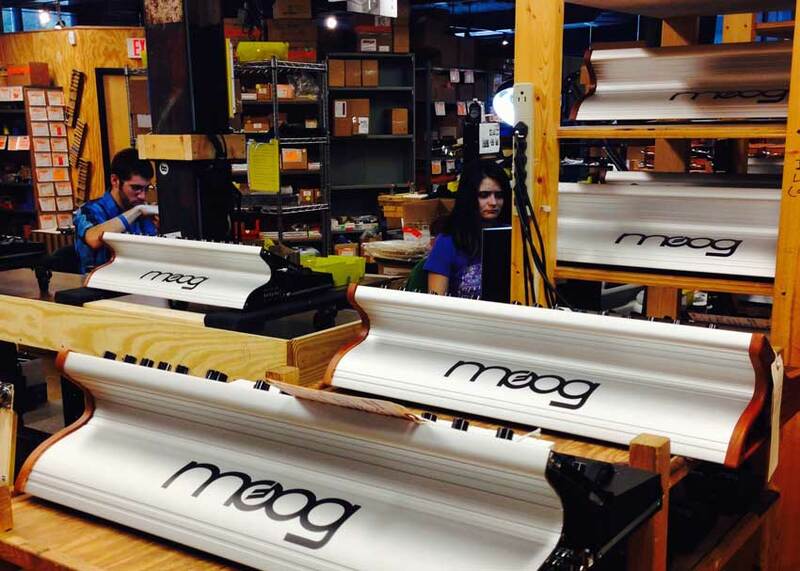 Moog technicians at work, surrounded by carts of Sub 37 synthesizers in progress. Each Moog synthesizer — like this Sub 37 — goes through a burn-in process of 48 hours. 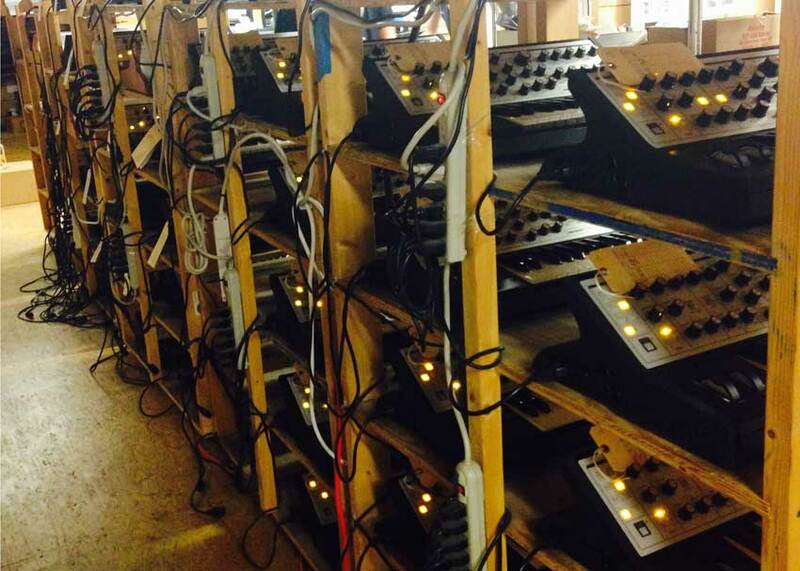 Some Moog Sub 37 synths are in the process of burning in, while others await their power harnesses and endplates. 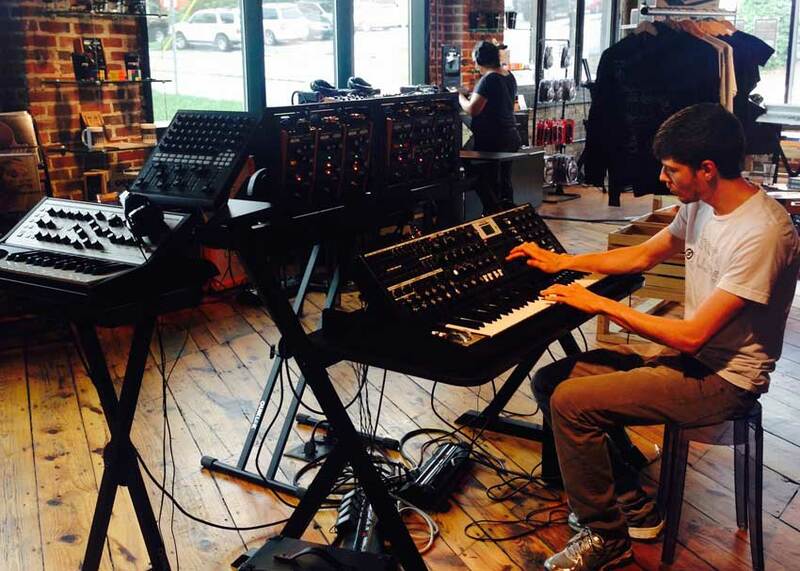 At the front of the factory is the Moog Store, where customers can walk in and try out the latest and greatest Moog gear. 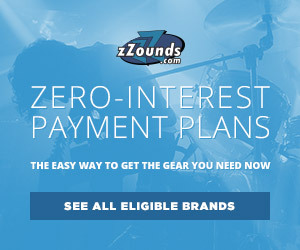 The Moog Store is full of cool collectibles. 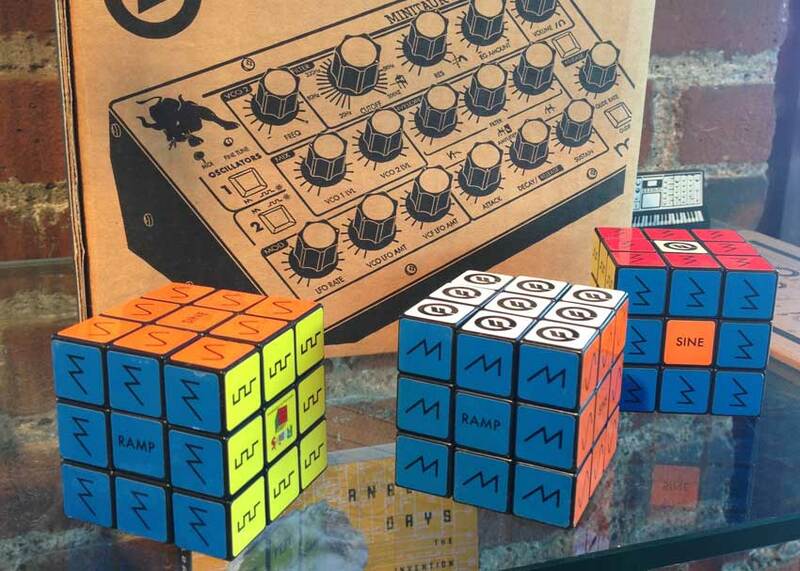 There’s even a Moog Rubik’s Cube — if retro-style toys are your thing! 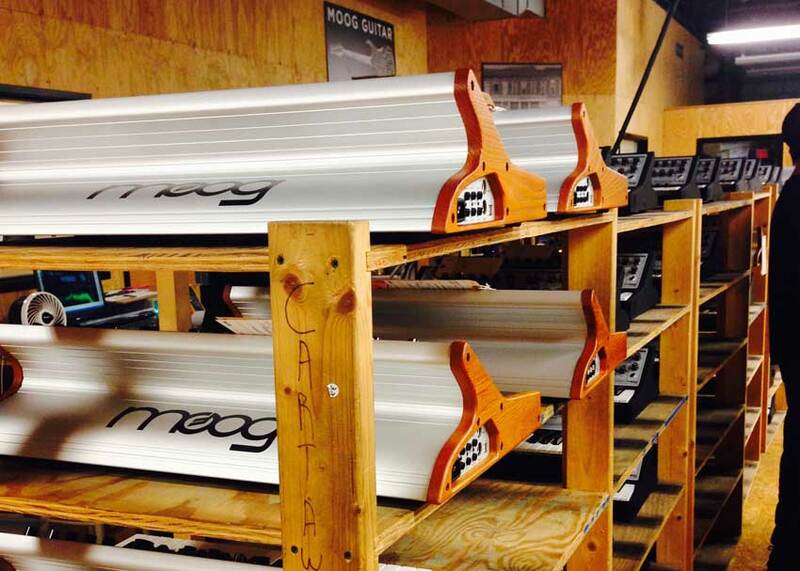 A rack of Moog Moogerfooger effects pedals, ready to be plugged in and “burned in” for 48 hours. 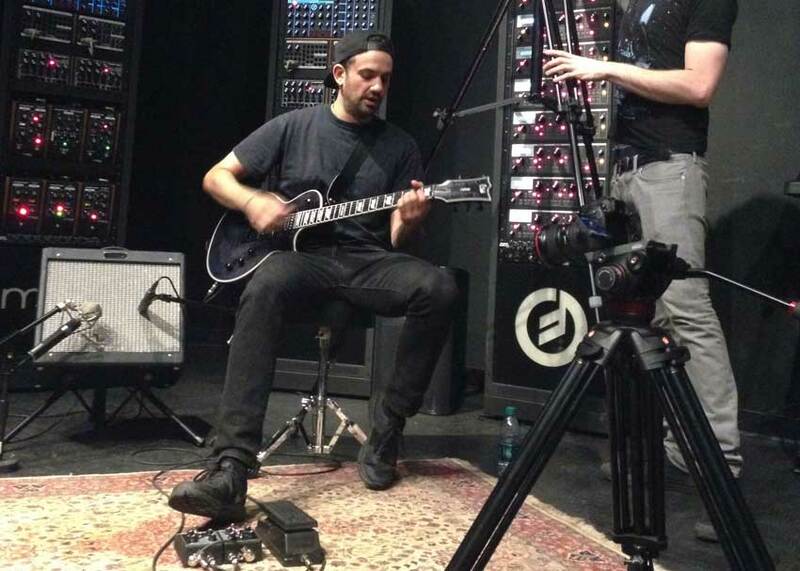 Upstairs in the Moog Sound Lab, guitarist Josh Chassner tries out a few Minifooger effects pedals for a video shoot. Anyone who’s ever built a cable (or an analog modular synthesizer) by hand will recognize the soldering iron and multimeter as tools of the trade. 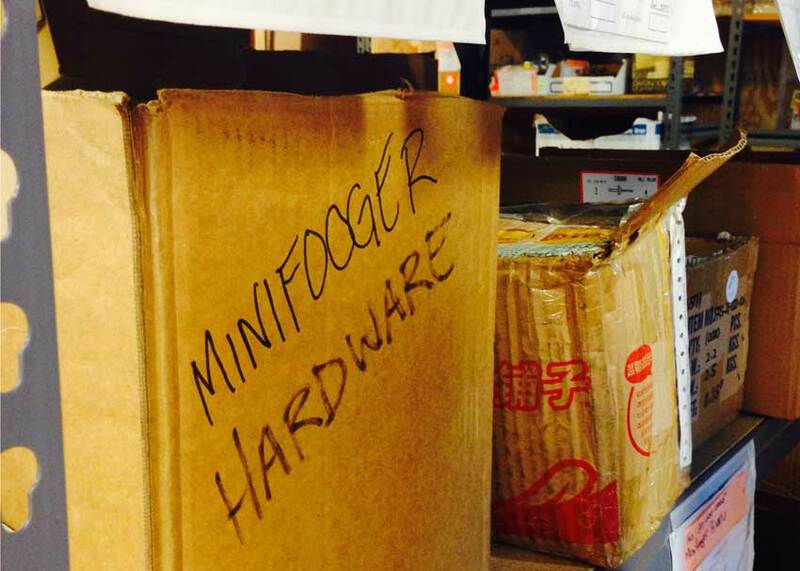 Minifooger effects pedals go through the same detailed assembly, calibration, and testing process as Moog’s flagship synths. 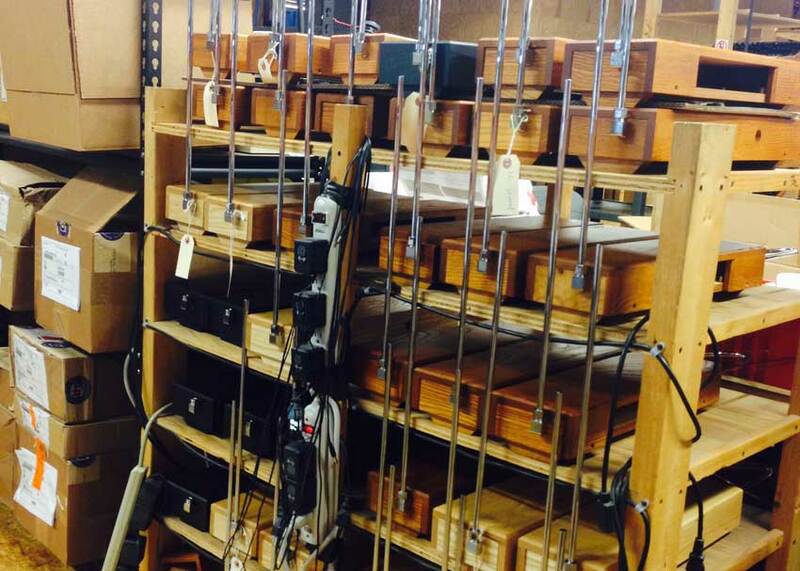 These shelves hold faceplates for Moog’s modular synthesizer modules — ready to be assembled by hand. 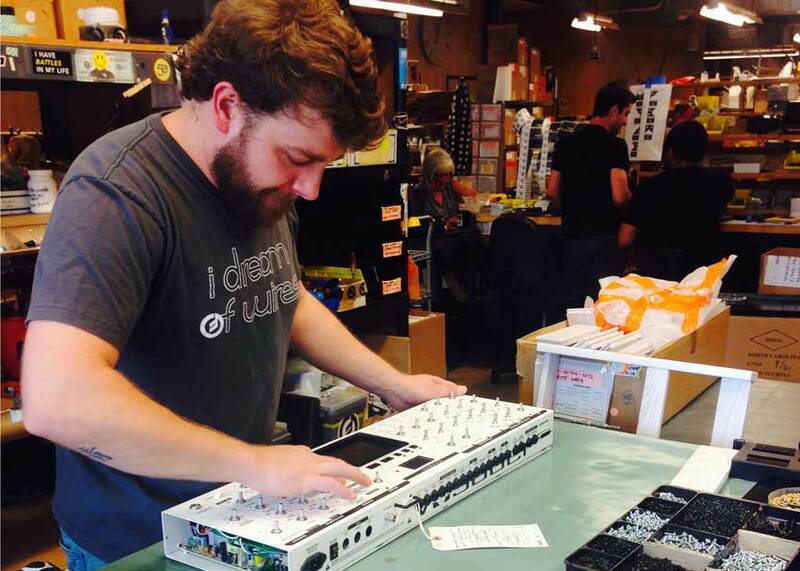 The sequencer module alone takes a skilled technician about 4 days to build from start to finish. Bob Moog built his first Theremin at age 14, and continued making them throughout his career. 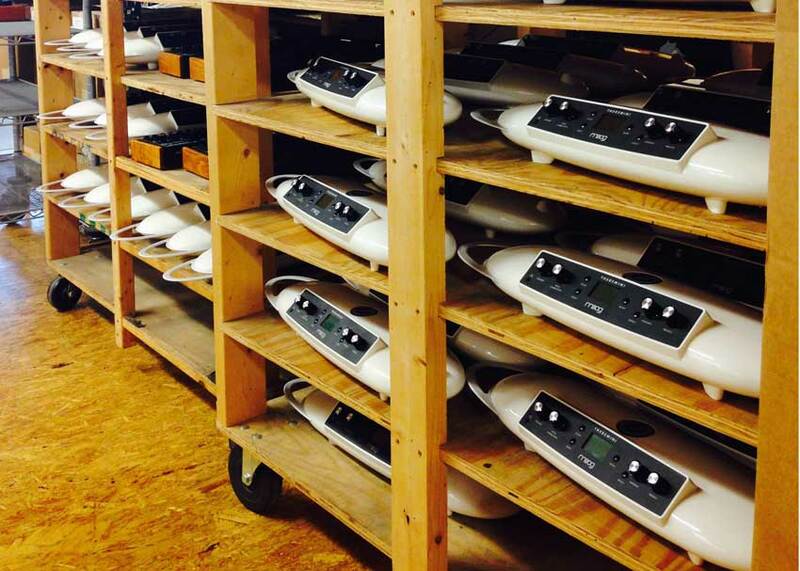 Moog is still the leading manufacturer in the world for Theremin instruments — like these Etherwave models. 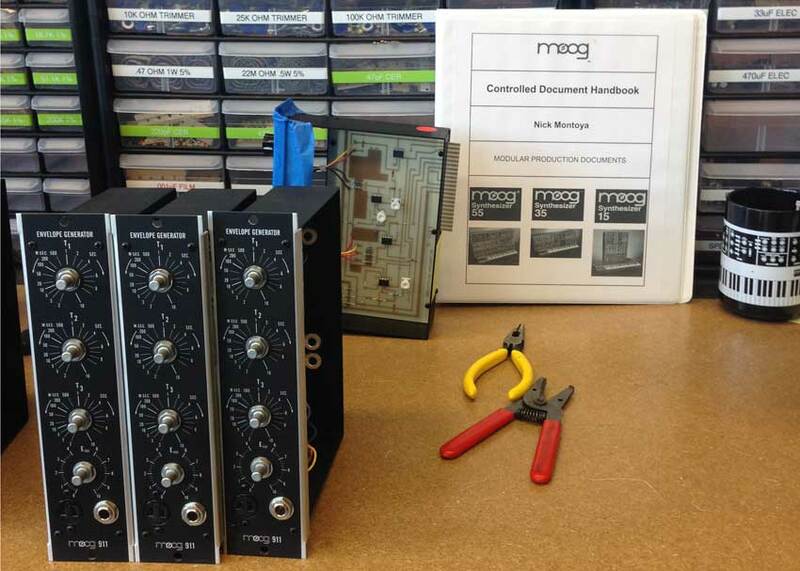 Each module in Moog’s modular synths is hand-wired here. 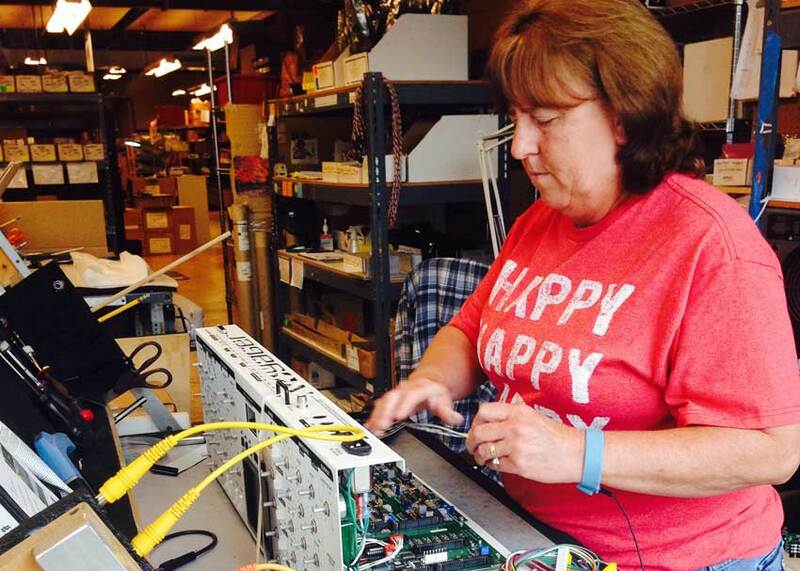 Where possible, Moog techs use New Old Stock components made in the 1960s and ’70s. 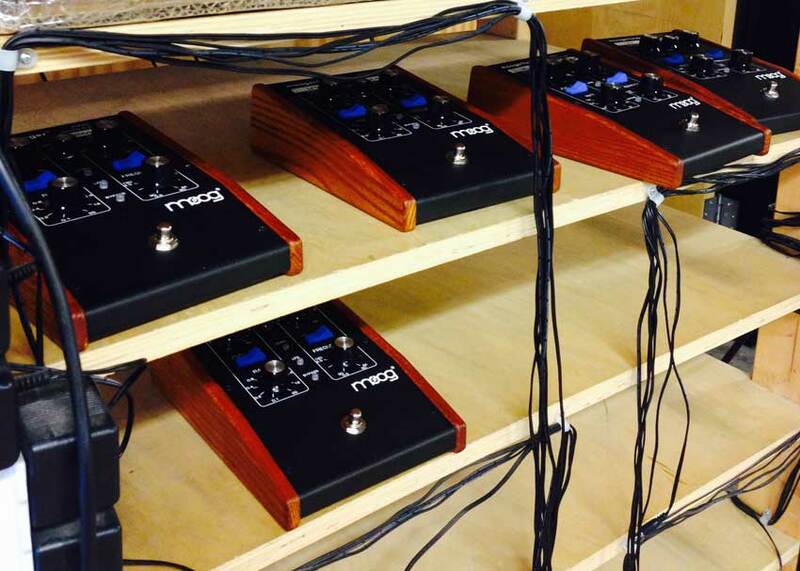 Visit the Moog factory? We don’t mind if we do. 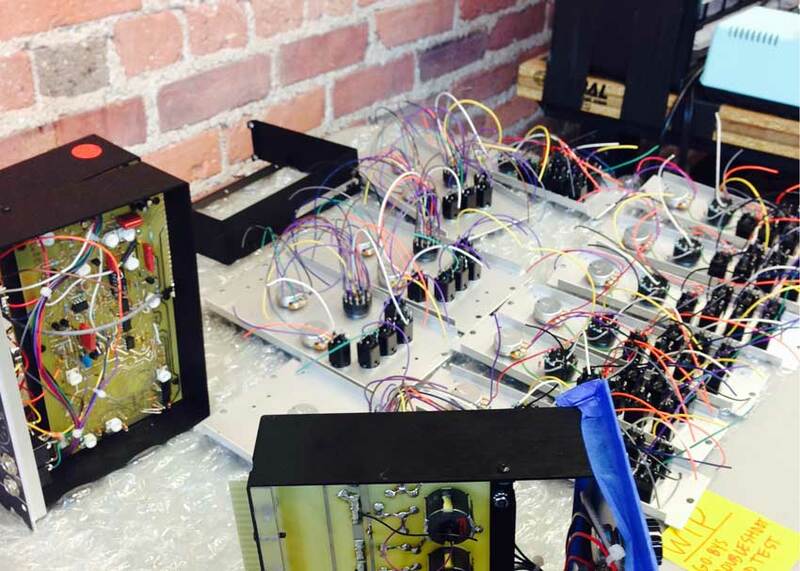 Installing knobs is just one step in the process of building a Moog Sub 37 synthesizer. 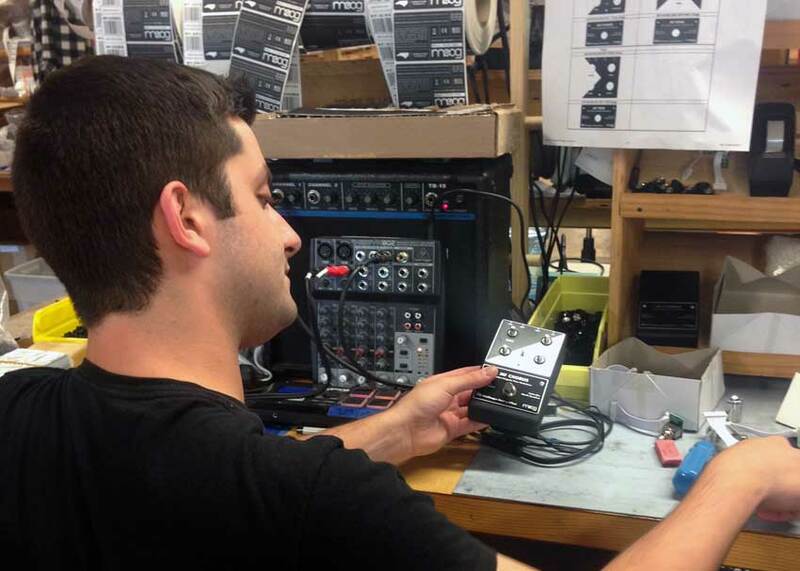 When you’re playing Moog gear, it’s always nice to get an extra hand dialing in your sound from the Moog employees that made it. 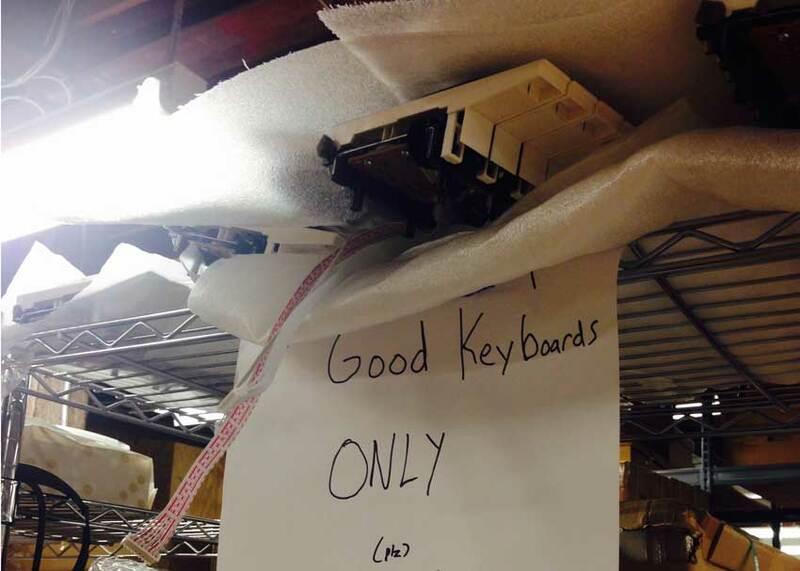 Good keyboards only. 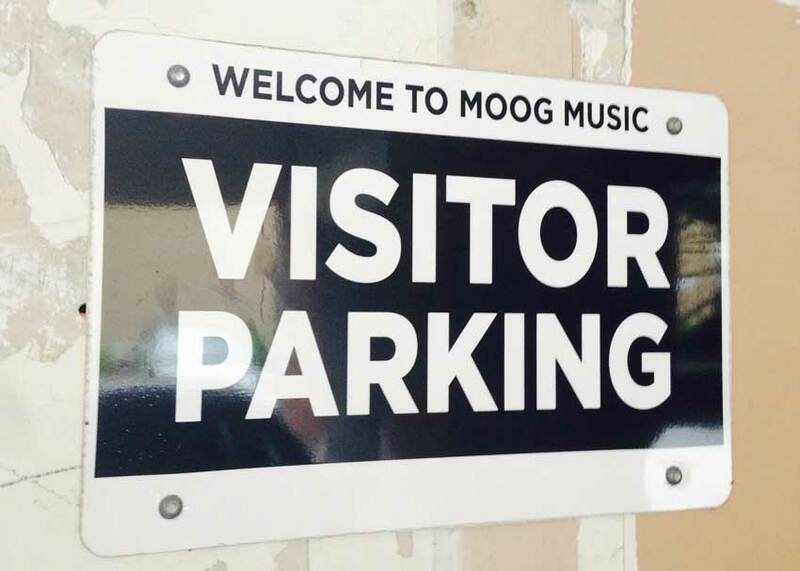 We’d expect no less at the Moog factory! You’d be “Happy” too if your job was building Minimoog Voyager synths — the latest evolution of a line of instruments started in 1978. 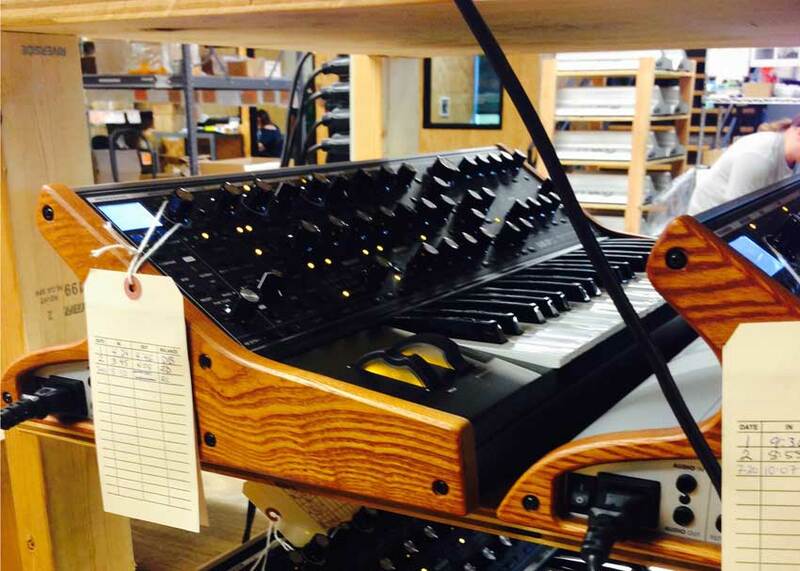 The wood for Voyager cases is sourced from Sparta, Tennessee — one state over from the Moog factory. 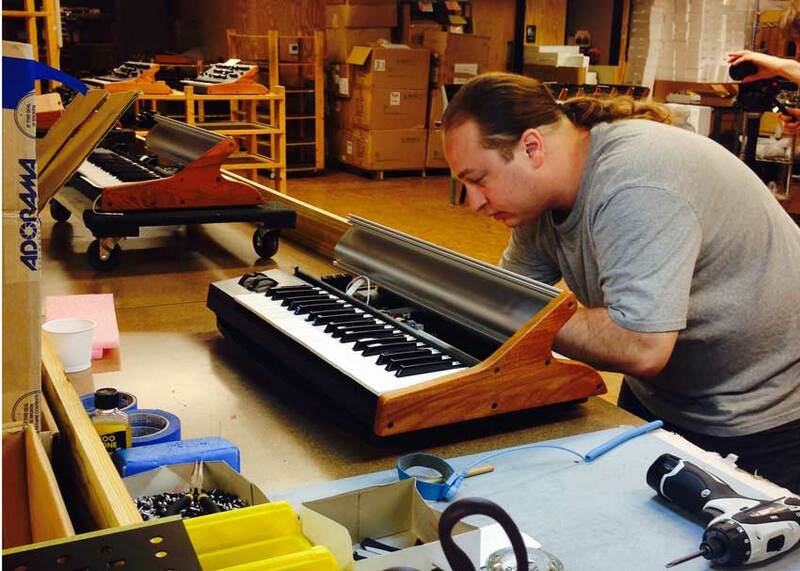 Moog technician TJ carefully matches wooden pieces for each Voyager case, then installs the left-hand controllers — pitch and mod wheels — which are built right here in the factory. 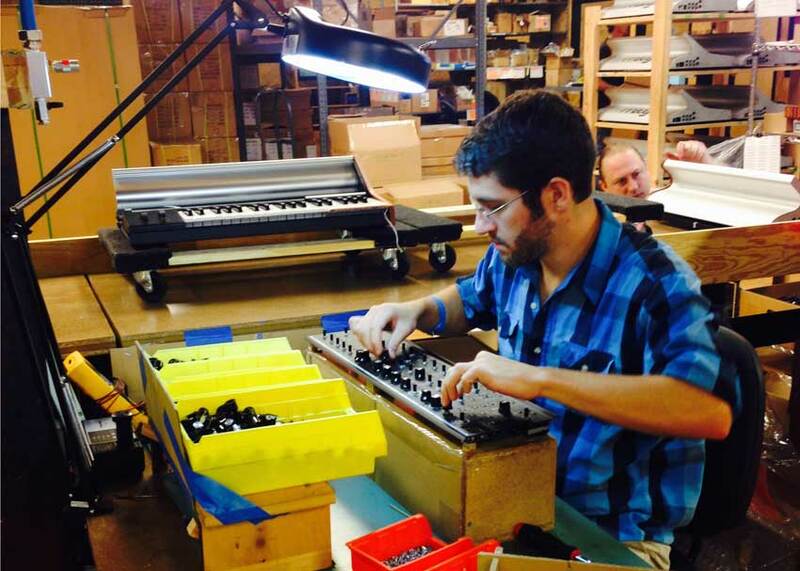 Each Minimoog Voyager goes through a detailed assembly process, with parts sourced locally whenever possible. Even the main circuit board is manufactured here in Asheville. 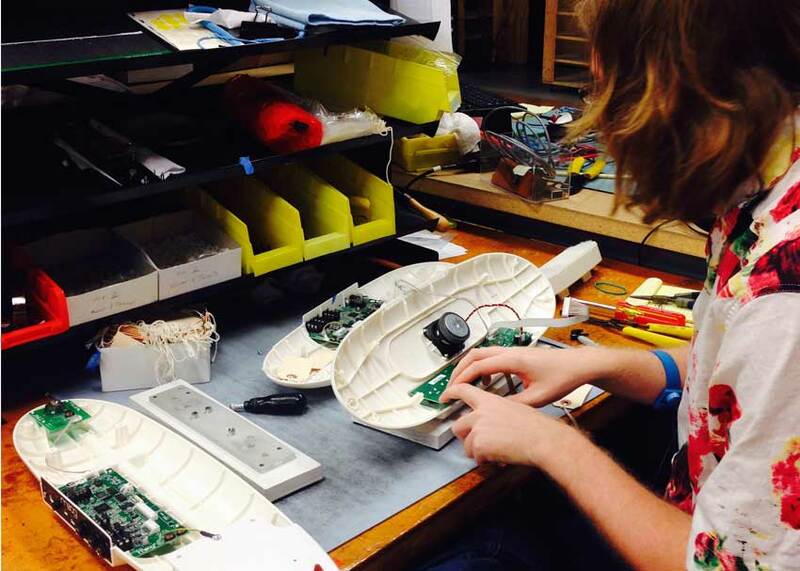 A technician assembles a Theremini theremin — the only current Moog product that features a digital synthesis engine. 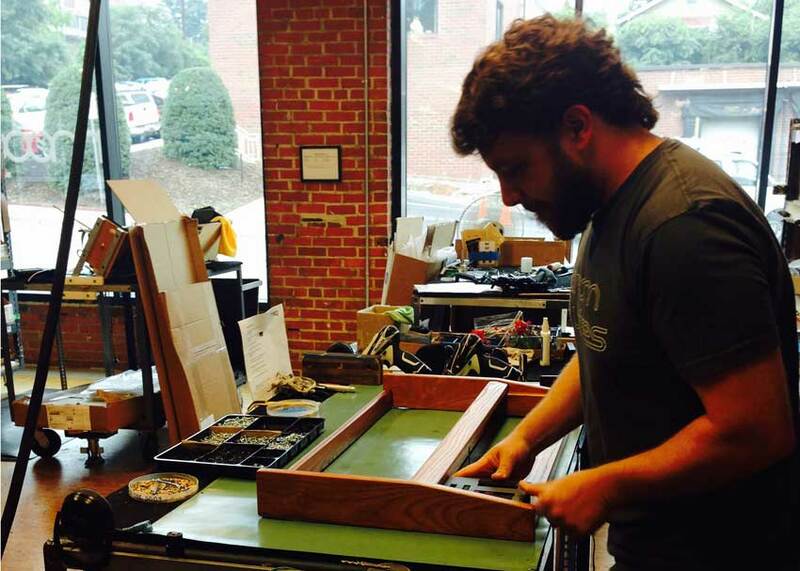 Installing the back plate on a Moog Sub 37. 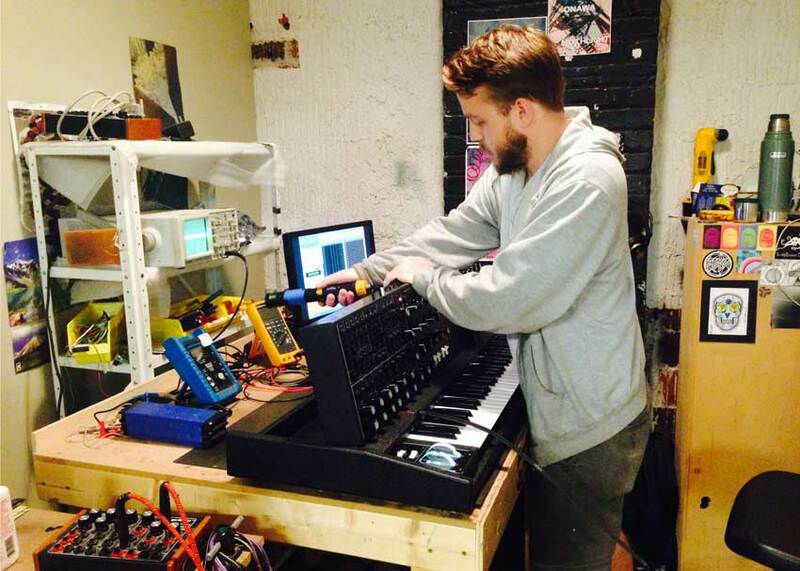 The production line runs day and night shifts, just to keep up with demand for this popular synth. 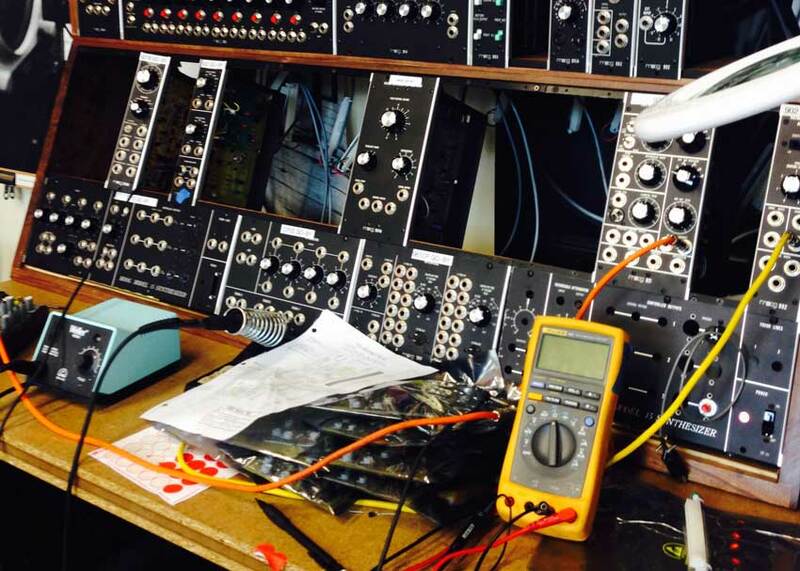 A Moog technician uses a multimeter, an oscilloscope, and MIDI software to test and tune this Sub 37 synthesizer. After each instrument has been calibrated and put back together, a technician does a final check to ensure that it sounds and feels as it should. If all goes perfectly, the process takes about an hour and a half. 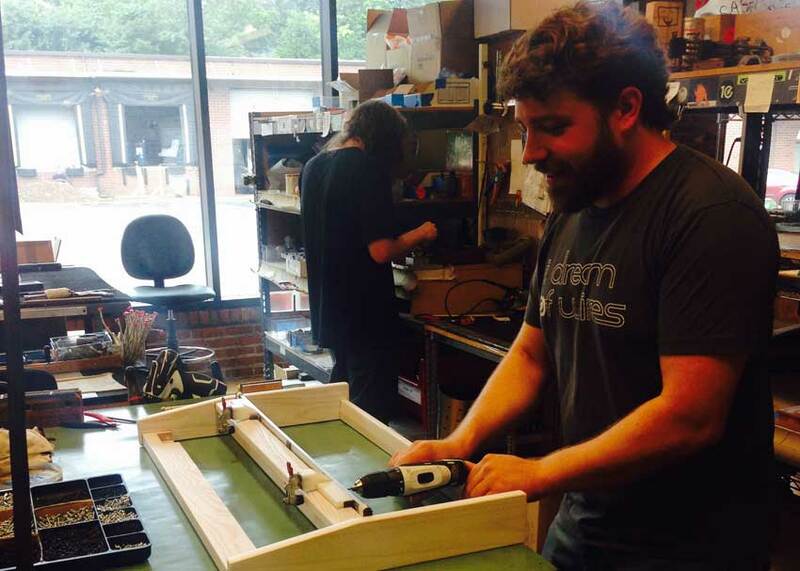 A technician builds a Minifooger MF Chorus pedal — Moog’s pedals aimed at guitarists.